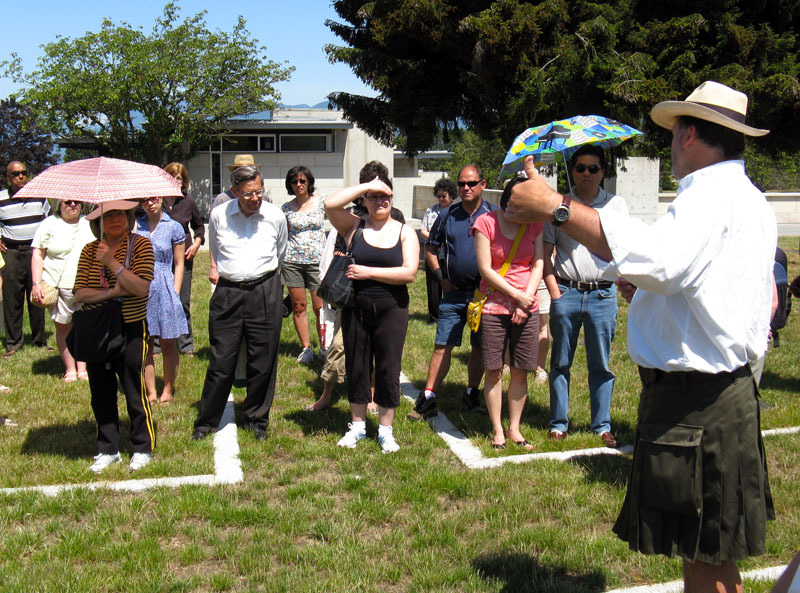 On July 11, 2009, Mountain View Cemetery—Vancouver, British Columbia’s only graveyard—invited the public to an open house to showcase its new buildings and columbaria. On-the-spot grave look-ups, four different cemetery tours, Chinese joss paper demonstrations, a string quartet, harpist and free popcorn all made for a pleasant day for cemetery boosters, curious potential customers and taphophiles such as myself. I attended two of the tours and explored on my own the whopping 106 acres of the grounds. 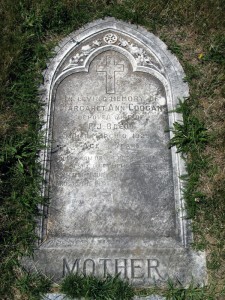 Opened in 1887, Mountain View contains 145,000 interments at 92,000 grave sites. By the mid-eighties the cemetery had no more plots to sell and, hemmed in by houses, had nowhere to expand. Even the designated cemetery pathways, recognized as prime real estate, have been filled in with graves. According to John Atkin, civic historian and tour guide extraordinaire, 86 percent of British Columbians prefer to be cremated. Inspired by this statistic, the city approved construction of columbaria, providing 2,200 urn spaces to tap this market. Click the photo thumbnails to see larger images. 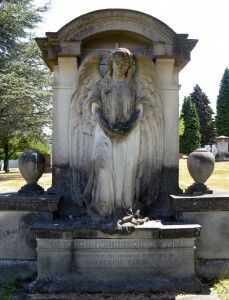 Each compartment, or niche, can hold up to two interments of cremains. Customers (residents?) 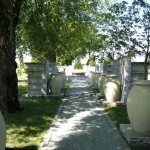 can choose to be in the main columbarium wall, which forms a courtyard around a portion of the Masonic section of the cemetery, or in smaller, tower-like columbaria that line a path toward a newly restored water fountain. I can’t help but notice the parallel between the smaller columbaria architecture and Vancouver’s condo-saturated skyline. It seems Vancouverites can rest in peace as they live—stacked in tall, stately structures. Accordingly, niches are priced with costs increasing the higher one resides above ground: the bottom row (with the worst view?) is $2,600, the second from the bottom costs $3,100 and all others fetch $3,800. The Masonic section was chosen for the columbaria due to its traditional graveyard aesthetics. 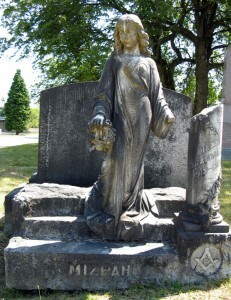 In the 1960s a city bylaw stated all headstones would be knocked flat unless the family requested otherwise. The purpose? To most efficiently mow the lawn. Well organized and fiercely traditional, the Masons busted out the phone tree and the requests poured in, rescuing the Masonic graves from certain obscurity. As part of revitalization and restoration initiatives, repentant cemetery officials have been turning markers upright, but it is a slow process—not terribly expensive, but there are thousands upon thousands of laid flat headstones to contend with. Mountain View has no regulations regarding body preparation for burials. Embalming is not required, nor are vault liners or even caskets. Due to lack of space, however, few burials are performed. To be interred in the ground there today, a family would need to have a plot purchased decades ago. 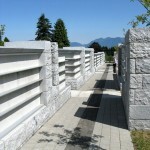 When markers were laid flat, the granite bases from military graves were used in the construction of the Stanley Park seawall. More than 10,000 infants—stillborn babies or those who lived only a few days—are buried in three sections of unmarked graves at Mountain View. The largest area now has a dry streambed memorial of over 6,000 stones, with each stone representing an infant. Families can purchase larger stones to have the child’s name engraved on it. 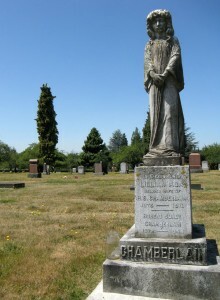 Located on the edge of the cemetery, the Vancouver Crematorium is a privately owned operation, a revelation which shocked and wounded the Canadian audience. As an American, I found this interesting—in the United States no one would question or even notice such privatization. 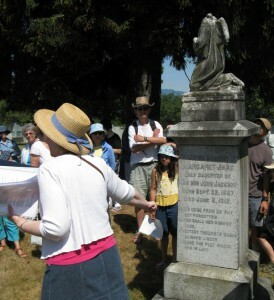 The other tour guide, Lorraine Irving of the BC Genealogical Society, focused on the lives and deaths of individuals in the cemetery, passing around copies of historical photos and reading from obituaries and contemporaneous news articles. I also noticed a few portable information stands placed by the graves of BC notables. This got me thinking… wouldn’t it be great to have cemeteries geotagged so as you wander around the graves and tombs, photographs, time lines, family trees, obituaries and other related info about the deceased would pop up on your phone? You could write personal remembrances that others could read, as well as visit distant cemeteries virtually. It’d be best open source, perhaps set up like a giant wiki to which anyone could contribute. Genealogists would freak. 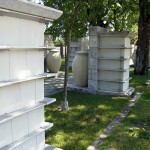 Posted by Meg Holle in Cemeteries, Death + Art / Architecture and tagged columbaria, tours. Bookmark the permalink. I find many mid-sized graveyards places of great artistry. There are unique stones, engravings and sculptures. I absolutely love the weeping angels, and often go to draw in cemetaries. It seems like this is a move to a more commercial uninteresting graveyard. Those unique stones are what makes a gravesite personal and meaningful. How disappointing. Yes, Mountain View had some poor management in the past, with the laying flat of stones. They are trying to bring them back up again, and to restore some vandalized monuments. It is unfortunate there’s no or very little existing ground-interment space. I agree, my idea of a cemetery is headstones and monuments of weepy angels, not a sleek columbarium (and certainly not a lawn). I do think MV is doing well with what they have (and according to what people want: cremation). It is pleasing aesthetically, but not really emotionally. With the columbaria niche inscriptions, there are strict guidelines of what can go on the tablet. Everything must be the same font with consistent line spacing so multiple niche tablets line up, and people are not allowed to place flowers on the aluminum shelves or anything on top or at the base. I realize the stateliness and solemnity comes from such consistency–plus you don’t want some screwball doing something offensive or stupid–but it seems terribly impersonal. I do think overall, the columbaria are gorgeous at MV and nicely integrated… but still, not really my idea of a graveyard. You could visit a columbarium and feel the somberness and peace, but I can’t imagine feeling a strong connection with an individual interred there–at least not the way you can when visiting a grave with a headstone or monument. Batesville Casket Co was one of the first to employ RFID tracking to prevent casket loss; presumably there’s a paper trail that could lead to a specific corpse. I also remember hearing that Katrina corpses were RFID tagged. Thanks for the tip, Daniel. RFIDing caskets and corpses is an intriguing idea–for inventory, for record-keeping, for security / perceived security. I could see RFID (or something a little more robust) being akin to coffin torpedos and other methods of preventing disinterment / theft, especially in the wake of Oak Burr. Ya know, as an add-on service. I’ll put it on my list of future posts to investigate.